Take the 30-Day Vegan Challenge and see the difference a plant-based diet makes in your life Whether you want to improve your overall health, shed a few pounds, demonstrate your compassion for animals, or help the environment, Colleen Patrick-Goudreau, dubbed "The Vegan Martha Stewart" by VegNews magazine, holds your hand every step of the way, giving you the tools, resources, and recipes you need to make the vegan transition - healthfully, joyfully, and deliciously. In this one-stop, comprehensive guide, Patrick-Goudreau: debunks common nutrition myths and explains the best sources of such nutrients as calcium, protein, iron, and omega-3 fatty acids helps you become a savvy shopper, eat healthfully affordably, restock your kitchen, read labels, and prepare nutrient-rich meals without feeling overwhelmed offers practical strategies for eating out, traveling, hosting holiday gatherings, and attending social events provides delicious, nutrient-rich, easy plant-based recipes empowers you to experience the tangible and intangible benefits of living a healthy, compassionate life, including achieving healthful numbers for cholesterol, blood pressure, weight, and more. 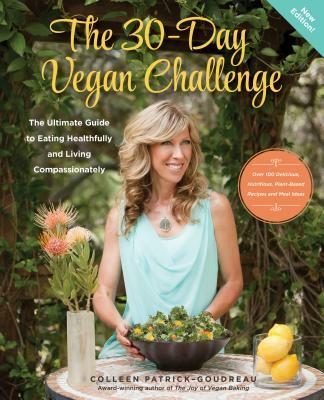 A recognized expert and thought leader on all aspects of living vegan, Colleen Patrick-Goudreau is an award-winning author of seven books. She is an acclaimed speaker and a multimedia host, beloved for her entertaining and informative videos and her inspiring podcast, "Food for Thought," which was voted Favorite Podcast by VegNews magazine readers. Colleen is a regular contributor to National Public Radio. Colleen has appeared on national and regional TV programs, including the Food Network, CBS, PBS, and FOX. Interviews with her have been featured on NPR, U.S. News and World Report, the Chicago Tribune, The Miami Times, Pacifica Radio, Rodale News, and in countless blogs and podcasts. Her recipes have been featured on Oprah.com and Epicurious.com. She lives in Oakland, CA, with her husband and two cats, Charlie and Michiko.